Most of organizations has data which it doest want it to be read or compromised by any one without authorization and in order to do so they have to employee security , but most of the organization don’t think about security as a goal but as a feature to be added to their product or environment or so. In this article we will be talking about security, security design and security threats and we are going to mention some frameworks used to achieve our goal. By security here we mean computer security, we will also see how to design a secure solution and how to think like an attacker to be able to design such solution. The Presenter: so in today’s subject we will be talking about security, so what do you have? An application can suffer from security problems. For example if the application allows only certain users to download valuable documents. So attacker can have access if there is a bug in how it ascertains the identity of the user. If the user’s identity is not ascertained properly, it may be possible for an attacker to get access to valuable documents to which she would not otherwise be granted access. The creators of the application can issue patches that can be installed to eliminate the vulnerabilities in the application. A patch is an updated version of the software. The patch does not have to consist of an entirely updated version, but may contain only components that have been fixed to eliminate security-related bugs. Operating system security is an important thing and the OS you are working in must be secure, most of the time this is not true (that’s why windows team always release security path every now and then and the patch is installed through the automatic update) so it is possible that attacker can exploit some vulnerability in the operation system so even if you are running a secure application, the attacker can still attack it since your application will relay on the operating system all the time. Network security is as important as the OS and application security we need to allow authorized and safe traffic and ban any suspicious traffic, in here we are talking about the packet level as there might be packets that would cause an unexpected behavior when handled by the software we need to secure which might enable the attacker to obtain restricted information , in order to get over this we could use firewalls and intrusion detection systems (but that is not granted 100% , some attacks might bypass the firewall and put his hand on the data we need to secure. Authentication is the act of verifying someone’s identity. For example when Alice is communicating with Bob she wants to make sure that she is communicating with Bob for real and not someone who impersonates Bob. ATM card: is an example of the something the user has authentication; an ATM card is a magnetic stripe that stores data (user’s account number). This data is used as part of the authentication process when a user wants to use the ATM. ATM is not that secure if anyone who has a magnetic stripe reader can access the information stored on the card, without any additional information, such as a PIN. It is also not that difficult to make a copy of an ATM card onto a blank magnetic stripe card. Since the magnetic stripe on an ATM card is so easy to copy, credit card companies also sometimes incorporate holograms or other hard-to-copy elements on the cards themselves to address such issue. Smart card: is another example for the something the user has, the smart card is not like ATM card, it is more difficult to make a copy of it or read its information the microprocessor, memory, and other components that make up the “smart” part of the smart card are glued together such that there is no easy way to take the card apart. The only feasible way to communicate with the microprocessor is through its electronic interface. Smart cards were designed with the idea that the information stored in the card’s memory would only be accessible through the microprocessor. A smart card’s microprocessor runs software that can authenticate a user while guarding any secret information stored on the card. In a typical scenario, a user enters a smart card into a smart card reader, which contains a numeric keypad. Alice will ask Bob to supply something he only knows (we hope he didn’t get drunk and tell other people the password) for example this might be a password or a PIN code. Most of the authentication techniques here are related to biometric techniques, in other words user’s biological activities are measured and taken as a way to authenticate the user. In the palm scan, the user will have to put his hand on a scanner which will scan the user hand, size of the fingers and hand and the curves in the hand (it is more efficient that finger prints). In the voice identification, the computer ask the user to say a particular phrase and compare the taken sample with any previous stored sample to find a match or a close match to the sample. social acceptance: people might reject the usage of such authentication method as they are not comfortable with it. false positive and negative: false positive occur when a valid user is rejected by the biometric device, while the false negative occurs when an attacker manage to impersonate himself as a valid user (the biometric methods suffer from this problem a lot as for example I might put a wax on my fingers to overcome finger prints scan devices). As we have seen here that we can’t revoke the user key but the keys in password systems are generated from passwords, and users can easily have their passwords changed if they are ever stolen or compromised. Biometric authentication becomes ineffective once attackers are able to impersonate biometric measurements. It is the act of checking if the user is allowed to carry on some action or no. For example Alice want to read a file or write in a file , before she make the action , the operating system validates her against this action to see if she is allowed to do it or no. In some ACL implementations another piece of information called a role is added, which enables a user or principal to access particular resource, for example all the users in the group programmer will be allowed to read the contents of a specific folder and won’t have the privilege of writing anything contained in this folder. Is an access policy determined by the system, not the owner. MAC is used in multilevel systems that process highly sensitive data, such as classified government and military information. A multilevel system is a single computer system that handles multiple classification levels between subjects (people who do action for example Alice) and objects (things action will be applied on for example document file). If Alice creates a new document, the system can decide that no one but Alice is allowed to access that document. Alice herself does not have the right to decide who else is allowed to access the file that she authored. Even if she wants to share the document she authored with her friend Bob, she is not authorized to make that decision. For instance, if Alice creates a file /home/Alice/document.txt in a system with a MAC model, there would be no way for Alice to decide on her own to allow Bob to see that file. In a MAC model, only the computer system determines who is authorized to access documents that Alice creates. Is an access policy determined by the owner of an object. The owner decides who is allowed to access the object and what privileges they have. In a discretionary access system, Alice could let Bob access a file at her discretion by issuing a command to the system, and then Bob would be given access to that file. For instance, in UNIX, which uses a DAC model, Alice could issue the command chmod a+r /home/Alice/document.txt to allow all users on the system to read the file. Is an access policy determined by the system, not the owner. RBAC is used in commercial applications and also in military systems, where multi-level security requirements may also exist. RBAC differs from DAC in that DAC allows users to control access to their resources, while in RBAC, access is controlled at the system level, outside of the user's control. Although RBAC is non-discretionary, it can be distinguished from MAC primarily in the way permissions are handled. MAC controls read and write permissions based on a user's clearance level and additional labels. RBAC controls collections of permissions that may include complex operations such as an e-commerce transaction, or may be as simple as read or write. A role in RBAC can be viewed as a set of permissions. We will see RBAC in action through this example, the CEO may be allowed to access salary information about any employee in the company, whereas a manager may only be able to access salary information about his or her subordinates. Another example might use the concept of a group in the UNIX operating system to implement RBAC. All users with a particular role would be placed in a group with the same name as their role (e.g., Alice and Bob would be members of the group programmer). The Bell-La Padula Model is a state machine model used for enforcing access control in government and military applications. It was developed by David Elliott Bell and Leonard J. La Padula, to formalize the U.S. Department of Defense (DoD) multilevel security (MLS) policy. In such applications, subjects and objects are often partitioned into different security levels. A subject (Alice for example) can only access objects (document.txt file for example) at certain levels determined by his security level. For example: Unclassified personnel cannot read data at confidential levels'' and Top-Secret data cannot be written into the files at unclassified levels. There are three rules that guide the decisions about which users are allowed to access which files: the simple property, the star property, and the tranquility property. The tranquility property: states that the classification of a file cannot be changed while that file is in use by any user of the system. (The file is not considered to be tranquil while it is being edited or written.). Simple security property (no read up): if acc is read, then level(subj) should dominate level(obj). Star property (no write down): if acc = append, then level(obj) should dominate level(subj); if acc = write, then level(obj) should be equal to level(subj). The ISO(International Organization for Standardization) defines confidentiality as “ensuring that information is accessible only to those authorized to have access" and is one of the cornerstones of information security.” In other words: the goal of confidentiality is to keep the contents of a transient communication or data on temporary or persistent storage secret. If Alice and Bob want to exchange some information that they do not want the attacker to see, the challenge is to make sure that attacker is not able to understand that information, even if attacker can see the bits that are being transferred over the network. Usually, some kind of encryption technology is used to achieve confidentiality which we will cover in the upcoming parts.For example, a credit card transaction on the Internet requires the credit card number to be transmitted from the buyer to the merchant and from the merchant to a transaction processing network. The system attempts to enforce confidentiality by encrypting the card number during transmission, by limiting the places where it might appear (in databases, log files, backups, printed receipts, and so on), and by restricting access to the places where it is stored. On an Ethernet network that uses a hub (as opposed to a switch), for instance, each computer is capable of actually seeing all the network traffic that is generated and received by any other computer. 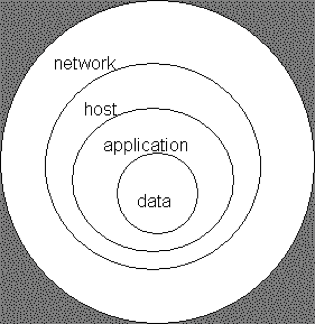 A computer’s operating system is typically responsible for only allowing applications running on that computer to access traffic that is directed to or from that computer, and filtering out traffic that originates or is destined for other computers on the same network. However, if a user has root or administrator privileges on a computer, that user can use a software package such as Ethereal, tcpdump, or dsniff to access network traffic. These software packages are run in a “promiscuous mode,” in which the operating system provides the software access to all traffic on the network instead of providing filtered traffic that is just directed to or from the computer on which it is running. While such packages exist to help network administrators and engineers debug problems but they can be used for eavesdropping. Integrity means that data cannot be modified without authorization. Alice and Bob can use an integrity check to detect if an attacker has missed up or modified the messages in their conversation. One approach that they can take to ensure message integrity is to add redundancy to the messages which would not be that effective as it will require a lot of communication overhead (and still won’t solve the problem). Another approach is to use CRCs (cyclic redundancy checks) to achieve integrity and detect when bits in a message have been lost or altered due to inadvertent communications failures. These techniques compute short codes that are functions of the message being sent. But this is still not sufficient because if the attacker knew that CRC is being used he can still change the CRC code so that it matches the modified message. A MAC is not only a function of the message itself, but is also a function of a key known only to Alice and Bob, such that even if attacker is able to modify the bytes of a message, he will not be able to appropriately modify the corresponding MAC. The goal of accountability is to ensure that you are able to determine who the attacker or principal is in the case that something goes wrong or an erroneous transaction is identified so in case of anything gone wrong you could have something that would prove that the attacker did illegal actions, this can be done by logging each action an authorized user does to keep track for every action user did. It is also important to make sure that once the logs are written they can’t be modified (the attacker wont be able to clear these logs or modify them) MAC (message authentication code) can be used to achieve such check. You can also use write once, read many (WORM) media to store system logs, since once written, these logs may be hard (or even physically impossible) to modify. If an attacker is able to make a system unavailable, a company may lose its ability to earn revenue, for any information system to serve its purpose, the information must be available when it is needed. This means that the computing systems used to store and process the information, the security controls used to protect it, and the communication channels used to access it must be functioning correctly. High availability systems aim to remain available at all times. An attacker that is interested in reducing the availability of a system typically launches a denial-of-service (DoS) attack. If the web site were run on a single web server, and an attacker transmitted data to the web server to cause it to crash, it would result in a DoS attack in which legitimate customers would be unable to make their activities until the web server was started again. running a web site can be vulnerable to an attack against availability. In a distributed denial-of-service (DDoS) attack, perpetrators commandeer weakly protected personal computers and install malicious software (malware) on them that sends excessive amounts of network traffic to the victim web sites. The servers running the victim web sites are then overwhelmed with the large number of packets arriving from the commandeered computers, and are unable to respond to legitimate users. It implies that one party of a transaction cannot deny having received a transaction nor can the other party deny having sent a transaction. In this part we have seen what security is and what are concepts of security, in the next part we will be looking about how to design and build a secure solution so stay tuned.